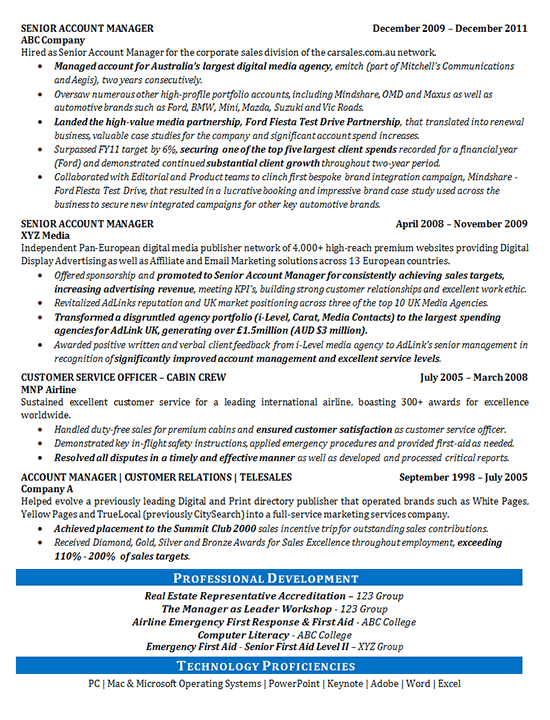 This resume was created for a client with a background in media sales that is attempting to re-enter the workforce after a long layoff. To ensure that the first thing that the reader’s notices is not the long layoff, the resume began with a lengthy introductory paragraph and summary of qualifications section. These sections work to highlight all of the key qualities that this client possesses that would interest employers. The goal is to hook the employers initially so that they are willing to overlook any employment layoff. From there, key accomplishments throughout the client’s employment were written in bold font to grab the reader’s attention. Toward the end, professional development was highlighted to demonstrate that the client has remained up-to-date with industry happenings and is dedicated to continuously enhancing her skill set. Finally, the resume concludes with a list of relevant proficiencies that would contribute to her worth in media sales. 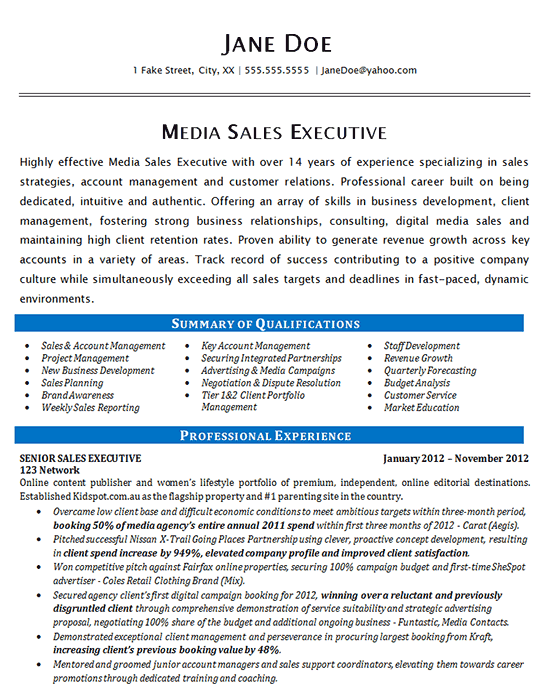 Highly effective Media Sales Executive with over 14 years of experience specializing in sales strategies, account management and customer relations. Professional career built on being dedicated, intuitive and authentic. Offering an array of skills in business development, client management, fostering strong business relationships, consulting, digital media sales and maintaining high client retention rates. Proven ability to generate revenue growth across key accounts in a variety of areas. Track record of success contributing to a positive company culture while simultaneously exceeding all sales targets and deadlines in fast-paced, dynamic environments. Online content publisher and women’s lifestyle portfolio of premium, independent, online editorial destinations. Established Kidspot.com.au as the flagship property and #1 parenting site in the country. Overcame low client base and difficult economic conditions to meet ambitious targets within three-month period, booking 50% of media agency’s entire annual 2011 spend within first three months of 2012 – Carat (Aegis). Pitched successful partnership using clever, proactive concept development, resulting in client spend increase by 949%, elevated company profile and improved client satisfaction. Won competitive pitch against online properties, securing 100% campaign budget and first-time advertiser. Secured agency client’s first digital campaign booking for 2012, winning over a reluctant and previously disgruntled client through comprehensive demonstration of service suitability and strategic advertising proposal, negotiating 100% share of the budget and additional ongoing business. Demonstrated exceptional client management and perseverance in procuring largest booking from customer, increasing client’s previous booking value by 48%. Mentored and groomed junior account managers and sales support coordinators, elevating them towards career promotions through dedicated training and coaching.